The soloists and chamber orchestras featured on these two discs use modern instruments: Steckel performs on an Urs W. Mächler (Speyer 2005) and Rische plays a Steinway. It comes as no surprise that C.P.E. Bach is renowned primarily for being one of the children of the great master Johann Sebastian Bach rather than as a composer in his own right. Emanuel as he is known is a significant link in the transitional period from the late-baroque music of his father towards the classical period composers Haydn and Mozart. At times I feel in this music a strong sense of looking ahead to the romantic era. Before the genius of J.S. Bach’s music became universally known it was the Weimar born Emanuel who was acknowledged as the finest composer of the Bach dynasty. As part of my own Bach dynasty pilgrimage I recall in 2011 visiting the Lutheran Stadtkirche St. Peter und Paul, Weimar where Emanuel was baptised. During the years 1740/68 Emanuel was engaged at the Prussian Court of Crown Prince Frederick of Prussia (who later became Frederick the Great) in Berlin. Following the death of his godfather Georg Philipp Telemann, Emanuel was appointed to the court of Princess Anna Amalia of Prussia at Hamburg serving between 1768 and 1788. Sometimes known as the ‘Berlin Bach’, Emanuel was a prolific composer who wrote in most genres, apart from opera. There are in excess of 300 piano sonatas mainly designed in the three movement fast-slow-fast form. Emanuel’s works have been catalogued by both E. Eugene Helm with his ‘H’ numbering system and also by Alfred Wotquenne signified by ‘Wq’ numbers. As was the custom of his father, Emanuel frequently wrote works and arranged them for other instruments. It is not clear whether the three concertos contained here were originally written for the cello or are transcriptions of keyboard concertos. It seems that the three cello concertos written in the period 1750-53 were intended for the general music society in Potsdam and Berlin rather than for the Prussian Court. 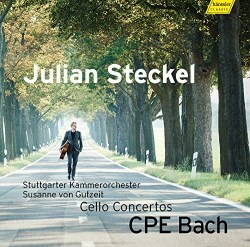 Cellist Julian Steckel clearly relishes these works, playing with considerable assurance and precision, bringing every bar to life. Robust when needed and tender at turns, the colour and detail that he produces is striking. In the B flat major concerto Steckel’s expressive playing of the Largo con sordino, mesto in its uncommonly high position is quite stunning. It would be hard to imagine better support than that provided by the Stuttgarter Kammerorchestrer under the confident direction of Susanne von Gutzeit. Their ebullience and refinement meet a purity of sound that achieves a certain cool quality as well as clarity and an agreeable balance. The booklet essay by Gottfried Franz Kasparek is an interesting and helpful guide. Emanuel’s relationship with the keyboard concerto was an enduring passion. He wrote his first whilst a teenage student at Leipzig and the final keyboard concerto of his 50 or so came in 1788 the final year of his life. Pianist Michael Rische is highly poised and unflappable with unyielding charm and sheer delight. Rische’s Allegros feel remarkably fresh and invigorating revealing utmost sensitivity in the central slow movements especially the delightfully played Adagio ma non troppo of the C major concerto. A match made in heaven is the combination of the piano and Kammersymphonie Leipziger allowing the music to shine through. Customarily playing without a conductor or director the Leipzig chamber orchestra is steadfastly responsive to the soloist. They display a fresh vibrant feel. The sonics have a similar quality to the Göppingen Stadthalle recording with the production team producing cool, vividly clear sound that is splendidly balanced. Rische has written the booklet essay which is easy to read and provides some interesting insights into his interpretation. Hänssler Classic can be justly proud of both these perceptive and engaging C.P.E. 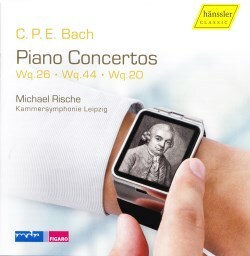 Bach recordings. The soloists and chamber orchestras have risen smartly to the occasion. First class results and remarkably well recorded too.